Recorded as from New York. (Harry Stone Gallery, New York, 1942). (Albert Duveen, New York), by whom sold in 1948 to Edgar William and Bernice Chrysler Garbisch; by bequest to NGA, 1980. American Primitive Paintings from the Collection of Edgar William and Bernice Chrysler Garbisch, Part I, National Gallery of Art, Washington, 1954, no. 71. 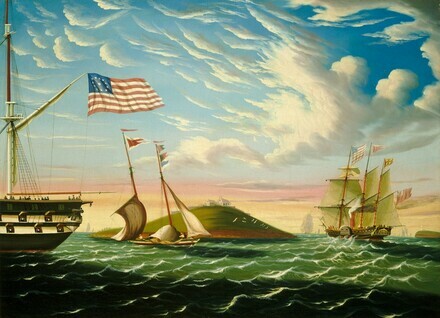 American Naive Paintings of the 18th and 19th Centuries: 111 Masterpieces from the Collection of E.W. and B.C. Garbisch, traveling exhibition by Amer. Fed. of Arts, New York, 1968-1970, no. 75. First venue: Grand Palais, Paris. Extended Loan to the White House for use by President George W. Bush, 2001-2003. Extended loan for use by Carla Hills, U.S. Trade Representative, Washington, D.C., 1989-1993. Extended loan for use by Chief of Staff Andrew Card, White House, Washington, D.C., 2001-2006. Extended loan for use by Chief of Staff Joshua Bolten, White House, Washington, D.C., 2006-2008. Thomas Chambers, Philadelphia Museum of Art, Philadelphia; The Hyde Collection Art Museum, Glens Falls; American Folk Art Museum, New York; Indiana University Art Museum, Bloomington, 2008-2010, unnumbered catalogue, fig. 2-8. American Paintings: An Illustrated Catalogue. National Gallery of Art, Washington, 1992: 137, repro. Chotner, Deborah, with contributions by Julie Aronson, Sarah D. Cash, and Laurie Weitzenkorn. American Naive Paintings. The Collections of the National Gallery of Art Systematic Catalogue. Washington, D.C., 1992: 49, repro. 48.